A place referred to in the Gospels, and probably also in the Talmud, under the forms , and , but not mentioned in the Old Testament (Pes. 53a; Tosef., Shebi'it, ed. Zuckermandel, 30, 71). According to John (xi. 18), it was "nigh unto Jerusalem, about fifteen furlongs off"; according to Jerome ("Onomasticon," ccviii. ), "in secundo ab Ælia milliario" (at the second mile-post from Jerusalem). This is the site of the village El-Azariyeh on the southeastern slopes of the Mount of Olives. The identification is established by the name "El-Azariyah," which is the Arabic form for "Lazarium," as Bethany was sometimes called by the Christians. The village, with its olive-, fig-, almond-, and carob-trees, is a little oasis in that barren region. 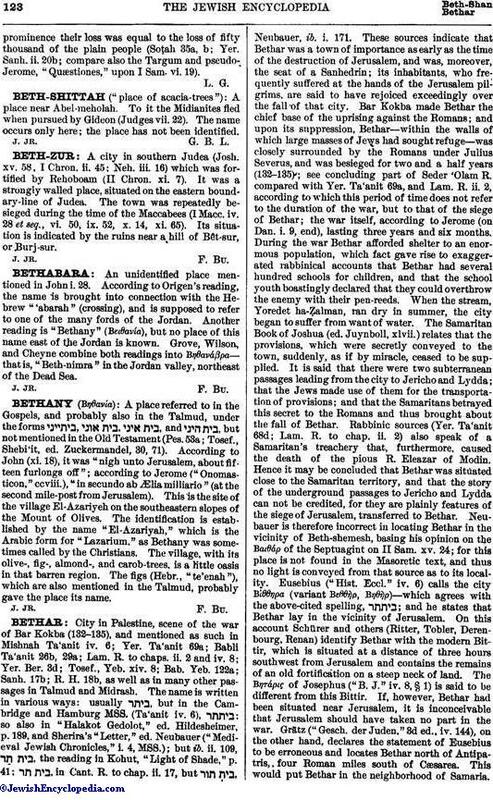 The figs (Hebr., "te'enah"), which are also mentioned in the Talmud, probably gave the place its name.